A commentary on glass furniture. With tackling global warming, pollution and our shrinking rainforests high on the agenda, living an ecological lifestyle is seen as the responsible thing to do. This is why eco furniture is growing in popularity all the time. It seems inevitable that eco houses will become more widespread in the future. And eco furniture, such as eco chairs, eco tables and eco sofas, enables you to start living in your own eco home today. Some scientists estimate that half the world’s mature tropical rainforests have already been cut down in the last 50 years, and that we could be left with only a fifth of the world’s rainforests by 2030. With rainforests so vital for reducing pollution and global warming, it’s essential that we find more sustainable ways of living. And this applies to the way we furnish our homes too. Eco furniture is built from recyclable materials or those from sustainable sources. Being made from recyclable parts means they can be easily disassembled and reused, whilst wooden eco furniture, such as eco chairs and eco beds, is made from wood taken from ecologically managed forests. 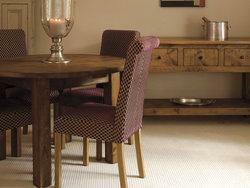 The environmental impact of eco furniture is also minimised by sourcing materials locally. This reduces the carbon emissions produced by transporting them to the workshop, compared to the pollution created by planes and ships hauling them across the Atlantic. A lot of cheap, mass produced furniture isn’t designed with longevity in mind. So it often deteriorates and breaks after a few years, instead of lasting a lifetime, as well designed furniture should. This leads to unwanted furniture becoming dumped into our already overflowing rubbish tips. Eco furniture, on the other hand, is designed to be durable and easy to repair. This helps it to last a lot longer than furniture which isn’t designed with sustainability in mind. So investing in eco furniture makes smart economic as well as ecological sense. Going green and creating your own eco home doesn’t mean you have to sacrifice on comfort and style. Eco furniture is just as luxurious, comfortable and attractive as any conventional item of furniture. In fact, lying in your own eco bed in your eco house can offer a heightened sense of comfort knowing you’ve helped to reduce pollution, save trees and take care of the planet at the same time.